Switzerland is voting in a referendum on whether to introduce what would be the highest minimum wage in the world. If approved, employers would have to pay workers a minimum 22 Swiss francs (about $25 or 18 euros) an hour. Supporters say the move is necessary for people to live a decent life. But critics argue that it would raise production costs and increase unemployment because young people would find it more difficult to get work. Correspondents say that the proposal “to protect equitable pay” is the most prominent of several referendums on Sunday. They include a controversial plan to buy Swedish-made Gripen fighter jets for the Swiss Air Force and to impose a lifelong ban against convicted paedophiles working with children. But it is a trade union-backed proposal to ensure that an annual salary is not less than $53,600 a year which has provoked the most debate. They argue that the measure is necessary because of the high living costs in big Swiss cities such as Geneva and Zurich. The unions are angry that Switzerland – one of the richest countries in the world – does not have a minimum pay level while neighboring France and Germany do. They argue that surviving on less than 4,000 francs a month is not possible because rents, health insurance and food are all prohibitively expensive. The minimum wage in Germany will be 8.5 euros an hour from 2017. 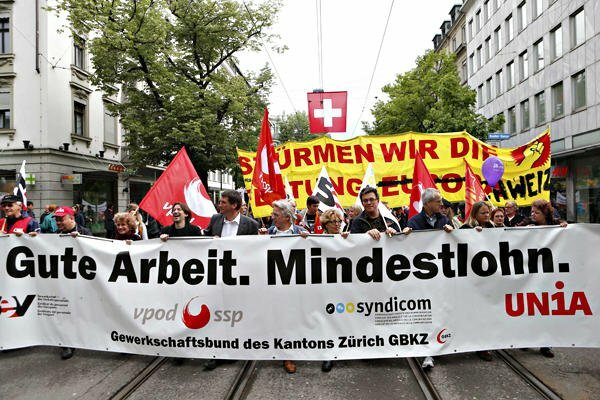 A key element of the campaign in favor of a minimum wage is the argument that the Swiss welfare system is being forced to subsidize businesses which refuse to pay a living wage. But business leaders and the government say that low unemployment and high standards of living for the majority show that there is no need for change. Small businesses, in particular Swiss farmers, are especially worried that being forced to pay their staff 4,000 francs a month would price their products out of the market. Most of Switzerland’s low-paid workers operate in the service industry, in hotels and restaurants, and the majority of them are women. Another vote, which was designed to ensure that bosses could earn no more than 12 times the salary of the lowest paid in their company, was narrowly defeated last November. The latest opinion polls indicate the minimum wage proposal may be rejected.